Character: Light toasty flavor, tending sweet. This is a specialty Japanese green tea with a good grade Japan sencha blended with the fire-toasted rice. 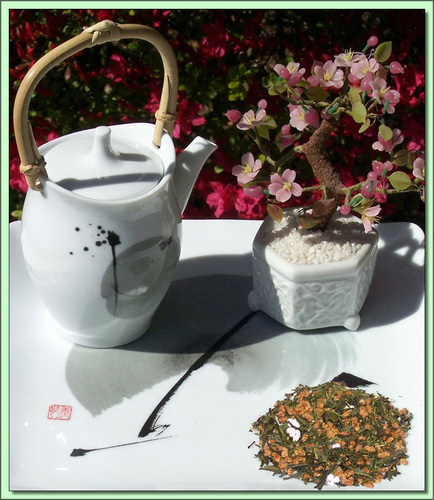 The fresh vegetative character of the green tea is imparted on the cup but it is tempered with the bakey-like character of the rice. There is a natural sweetness and almost chewy character to the finish of this tea. During the firing of the rice, it is not uncommon for rice to 'pop' not unlike popcorn, hence the pet name 'popcorn-tea'. Legend has it the tea is named in honor of an unfortunate servant named Genamai in the 1400's who accidently dropped rice in his warlord master's tea. Genmia paid with his head, but The resulting flavor was so unique that the warlord pronounced this rice and tea be served every morning and be called Genmaicha (cha being 'tea' in Japanese). Produced under ISO 14001 Certified Environmental Management Standards.